← How to convert PDF to GIF image? After I convert a Word document to PDF file, I want to check which fonts embedded in PDF file, how to check this? When you want to convert word to pdf file,you should use the software PDFcamp Printer.PDFcamp Printer allows you to convert many kinds of files to pdf file only by several clicks. But how to do this job?Here are some steps you can follow. First,open a word document and click the button“file”—“print”,of course you can use the hot key “Ctrl”+ “P” to start the printer.You should select the printer in the popup window as PDFcamp Printer.Then you can set parameters in “properties”just like “font embedding”, “save as”, “compression” etc. Second,you can save and name the new created pdf file,then click “OK” in “save as” window. After that,there will come out a pdf file which is converted from word document. But someone may ask “How can I see the properties of the new pdf file such as which fonts embedded in it?”This is a good question,you can check the information of the pdf file like this. You can open the new file you’ve just created and press “Ctrl”+ “D”,or you can click “file”—“properties”.Then you can see a “document properties”window of this pdf file.Of course you can check the basic information of the file in it,such as description,security,fonts,custom,and so on.By clicking “Fonts”,you are able to check the font embedded in the pdf file. Not only the file converted from word to pdf can be checked by this way,all pdf files can be,too. There’s a hyperlink in my ppt file, can I convert it into PDF file? 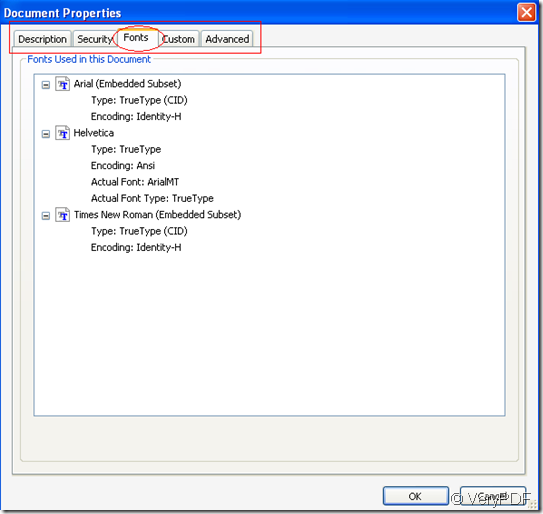 How to create 128/40 bit password protected PDF documents? How to download Wikipedia Pages as PDF file? How can I print a Excel document to text file by PDFcamp Printer? Why can't I uninstall PDFcamp Printer? This entry was posted in PDFcamp Printer and tagged word to pdf. Bookmark the permalink.